A few weeks after I arrived in Lebanon to volunteer with Syrian refugees, I learned that my plan to offer an English class for both Lebanese and Syrian youth in the small town of Bqarzla was so sensitive as to require an audience with the village priest. After Sunday mass in the village church, a fellow volunteer, Samer—Syrian, Orthodox Christian—and I were escorted to the high-ceilinged sitting room of the priest’s spacious quarters next door. A group of men wearing suits and smoking cigarettes—village notables and friends of the priest—had been invited to join us. They greeted us amiably and invited us to sit. Abuna did not visibly react to my remark, but he and his friends launched into a spirited discussion in Arabic, which I only partially followed. Afterward, Samer told me that they had been opining that immigration was ruining America and that Trump would set things straight. The conversation echoed others I had been privy to, focused on tensions around immigration in Akkar, a remote district in northeastern Lebanon on the Syrian border. A common complaint here is that the Syrians are taking jobs and hogging resources provided by the government and international aid organizations. Some Lebanese Christians I spoke with also told me they view the primarily Sunni Muslim refugees as a demographic threat. Lebanon has refused to hold a census since 1932 lest the findings upset the precarious balance in its political system, which parcels out its top leadership posts based on religion. Clearly Abuna and his friends saw in Trump someone they believed would be sympathetic to their plight. Fortunately, our political differences did not prevent Abuna from granting my English class his seal of approval. Bqarlza is tucked away in the hills of Akkar. The occasional army helicopters overhead are a reminder of the war next door, but the village itself is sleepy, surrounded by the olive groves that drive much of its economy. If you changed its language and the architecture, the Maronite Christian enclave could easily pass for a small Texas town. The streets outside of Bqarzla are littered with shell casings and sometimes bird carcasses left by the local men who go out shooting every morning before dawn. Young people hang out at a couple of pool halls and a pizza shop. The neighbors take note of whether you went to church on Sunday. The backdrop of many conversations I’ve had is a contentious history between Lebanon and Syria that dates back at least as far as 1976, the beginning of Syria’s three-decade occupation of Lebanon, shortly after the outbreak of the Lebanese civil war. There remains a complicated and sometimes fluid map of loyalties for and against the Syrian regime in the Lebanese political system and society. Perhaps because I am an American, perhaps because there is a sense of recognition across complicated political landscapes, these conversations frequently come back around to the U.S. election. Local Lebanese acquaintances in Akkar told me before the election that they liked Trump because he is a zelameh (real man) or that they didn’t like either Trump or Clinton, but at least Trump would be something different. I might have heard the same things in any number of small towns back home. Local Lebanese acquaintances in Akkar told me before the election that they liked Trump because he is a zelameh (real man) or that they didn’t like either Trump or Clinton, but at least Trump would be something different. 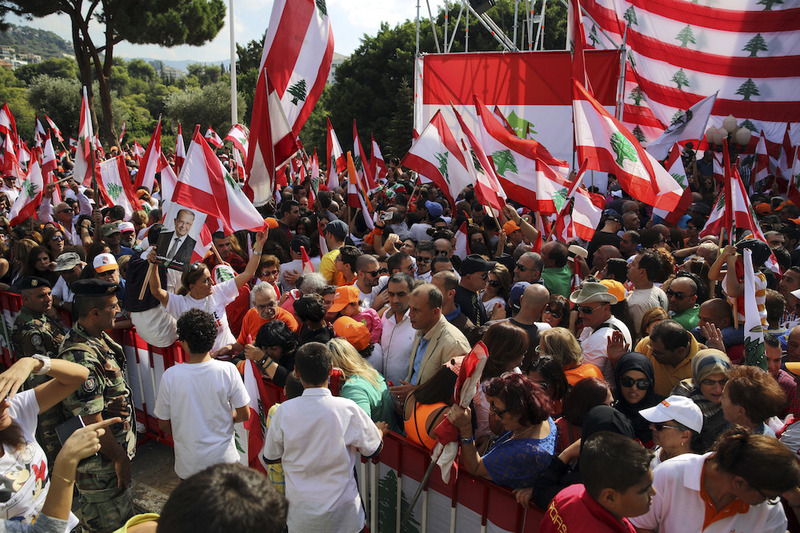 A week before the U.S. presidential election, the Lebanese parliament settled on their own new president after a two-year standoff, and the battery of celebratory gunshots turned the streets of Akkar into a mock war zone. As supporters of Lebanese president-elect Michel Aoun commenced their jarring festivities, I was driving home from teaching a remedial French class to Syrian kids. In the olive groves and empty lots in and around Bqarzla, Syrians live in scattered clusters of tents provided by the UNHCR, known in English as the United Nations’ Refugee Agency. Many of them, although registered as refugees, are not legally authorized to be in the country, leaving them in a tenuous position and largely restricted from traveling and working. For a couple of months in the fall most of them work the olive harvest, a brief bright spot before winter comes, the work dries up, and the rainy season tests the soundness of the plywood and plastic sheets reinforcing their makeshift homes. From UNHCR, they get basic assistance with food and shelter. From the Lebanese government, they get the right to send their children to the local public school, which is largely abandoned by the Lebanese who send their children to private schools if they can scrape together the funds. NGOs like the one I volunteer with fill in some of the gaps, including supplemental classes to help children who are struggling in Lebanese schools. In an English class I was teaching at one of the informal refugee camps the week before the election, we practiced saying what we did and didn’t like. Several of my Syrian students listed Trump among their dislikes, along with flies and traffic. Mohammed, a quiet teenager from Aleppo with an easy smile, echoed my assessment of then-candidate Trump: “Huwweh majnoon.” (“He is crazy”). The night before the U.S. presidential election, Samer and I dropped by one of the refugee camps in the olive groves outside of Bqarzla. We sat on the floor and drank black tea and mate with a group of young refugees from Hama. It was cold and windy outside, but inside the tent, the family had set up their sobia, a wood burning stove, and the small room was soon warm enough that I took off my jacket. We didn’t talk about the election or the war in Syria. The next morning, I stared at the television in a stupor as Trump made his acceptance speech, interrupted briefly by one of Lebanon’s frequent power outages. I suddenly felt very far from home. During the next day’s adult English class with the refugees, I joked that I needed to look for a husband from Canada. Abby Sewell is a freelance journalist based in Lebanon. She previously reported for the Los Angeles Times before relocating to Lebanon to volunteer with the NGO Relief & Reconciliation for Syria. Primary Editor: Sara Catania. Secondary Editor: Sophia Kercher. *Photo by Bilal Hussein/Associated Press.